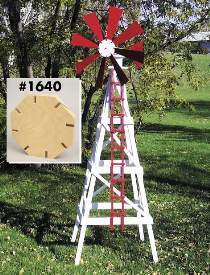 This yard windmill is designed after the farm windmills which were and still are used to pump water for livestock or to irrigate farms and ranches. It stands approximately 91"H to the top of the blades. Uses standard size lumber and exterior plywood for the blades and tail vane. Special bearing kit ensures smooth operation. Plans show exactly how to cut the hub, or you can order our precut hub which has all machine work already done except for cutting the final round shape. Order the #1255 Bearing Kit, three pieces of #9559 Plywood, 1/8" x 12" x 12" (for blades), one piece of #9560 Plywood, 1/4" x 12" x 12" (for tail vane) and one each #1640 Precut Hub separately.